Nowadays watching YouTube videos is among the best methods of entertainment for people owning smartphones like Samsung Galaxy Note 3, to name a few. Despite your device holds a super large FHD screen that is considered to be nothing less than on-the-move media player, enjoying YouTube videos on it may be anything but smooth considering the squirmy network speed and unsteady internet connection. Worse still, YouTube videos are usually saved in FLV format which is incompatible with this Samsung gadget. So the easiest method is to simply download YouTube into Galaxy Note 3 recognized format, so that you can watch it whenever you like, even if you're offline. When it comes to the process of downloading YouTube video to Samsung Galaxy Note 3/4/5/7/8/9, you may doubt about it as Google had removed the stop download option from the context menu on the YouTube video player. Fortunately, there is always a silver lining. 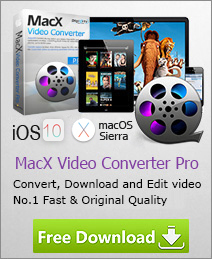 MacX Video Converter Pro is ready for your service. Working as a preeminent YouTube downloader and video converter, it gives you the option to download YouTube to Galaxy Note 3 with hardly a glitch while holding almost the same quality as original. More strikingly, this software delivers up to 5X faster speed transcoding YouTube videos to Galaxy Note 3/4/5/7/8/9 compared with other similar software. Therefore, you can play YouTube videos anywhere anytime. MacXDVD provides two versions respectively for Mac and Windows users. 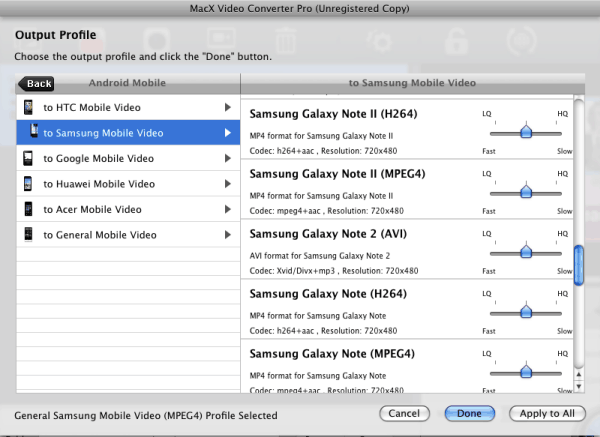 And MacX Video Converter Pro is especially designed for Mac users to download YouTube to Galaxy Note 3. For Windows users, please head over to Windows Version MacX HD Video Converter Pro. Step 1: Add YouTube Video URL. Click "YouTube" button on the main interface of MacX Video Converter Pro, the built-in YouTube Downloader window will pop up automatically. Then copy and paste the YouTube video URL to the address bar. After you click "Download Now", the rest video downloading job will be automatically done by this YouTube video downloader. After the download, the downloaded YouTube video will be automatically added to the convert list. Then you can choose the output format as you like from the drop-down box. To convert YouTube video to Galaxy Note 3, you can simply hit Android Mobile -> to Samsung Mobile Video -> Samsung Galaxy Note 2/3/4/5/7/8/9 -> Press Done. Tips: Being famous for its ultimate HD video converting feature, MacX Video Converter Pro also lets you convert HD videos, no matter MKV, M2TS, MTS, MOV video files or other recorded AVCHD videos, to Samsung Galaxy Note 3 with a few clicks, so that you can enjoy not only YouTube videos but also HD videos on your Galaxy Note 3 anywhere anytime. Hit the "RUN" button to start encoding the downloaded YouTube video to Galaxy Note 3 on Mac. After a period of conversion, you can import and play YouTube on your Galaxy Note 3 without any limitation. With 280+ profiles infused, MacX Video Converter Pro sweeps away all obstacles and helps you convert video to a myriad of mobile devices, e.g. convert FLV to iPad Mini, WMV to iPhone 5, MKV to Galaxy Tab, etc, all at one blow. The guide centers on how to rip DVD to Galaxy Note 3 readable format in a snap. With the best DVD ripper for Galaxy Note, you can convert protected DVD to Samsung Galaxy Note 3/2 for watching on the go limitlessly. Ever wondered how could download Youtube video and playback on your iPhone for Mac? This guide article will show you how to download video from YouTube and playback on iPhone with all-in-one Youtube downloader. Anyone who is eager to download YouTube video to Google Nexus 7 can try MacX Video Converter Pro, with which you can convert YouTube video to Nexus 7 recognized video format for offline playback with lossless video quality.